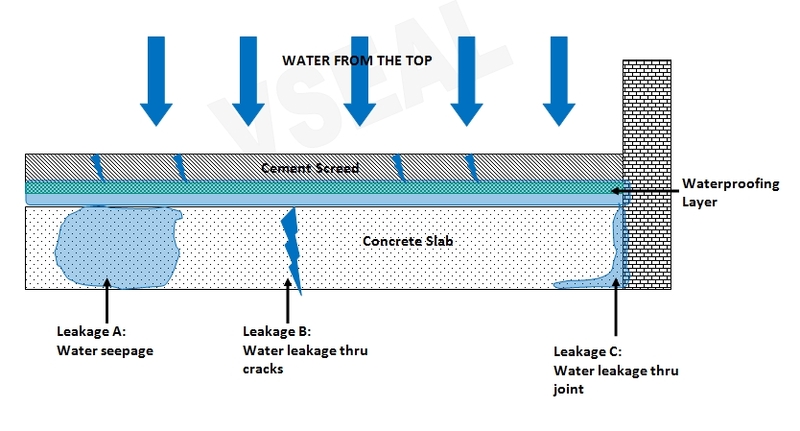 The above diagram generally explains how the waterproofing leak thru the concrete slab. When the water falls from the top, the water will be absorbed into the cement screed. The cement screed will act like a sponge and continuously absorb the water from the wet surface. In the event that the cement screed has cracks surface, it expedites the water absorption. Eventually all the water that absorbed will be stayed underneath the cement screed. The waterproofing layer underneath the cement screed will prevent the water leak to the concrete slab. However, if the waterproofing layer has failed, the water will penetrate thru the waterproofing layer and pond at the concrete slab. Leakage A: Water seepage due to the honey comb, not compact enough or not up to the grade. Leakage B : Water leak thru the cracks of the concrete slab. Leakage C : Water leak thru the intersection joint between the wall and floor. In order to rectify these leakage issues, Vseal Engineering has used the German technology and imported material to rectify such problems. In general, such problems could be addressed thru the following method without hacking the existing cement screed.